The study of how information is collected, organized, manipulated, classified, stored, retrieved, and visualized. It is obvious that we live in a data-centric world! People are getting rich by leading the way in capturing and packaging data in creative ways. 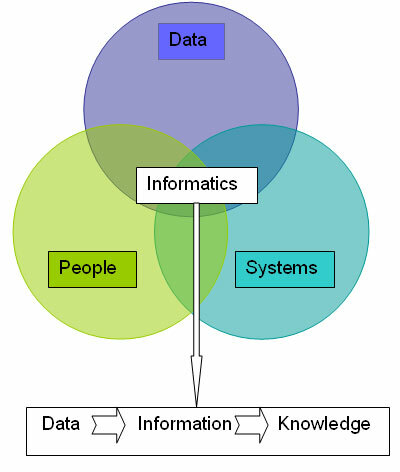 Informatics is the study of how we collect, store, manipulate, retrieve, and visualize data. Not only is Informatics a key tool for popular web applications, but also for just about any other discipline: life sciences, social sciences, business, mathematics, and engineering. The real winners in this new world will be the ones that have the tools to transform data into information and then into knowledge. In fact, our ability to find answers to the most pressing problems of today, such as global warming and curing diseases, depends on our abilities to develop innovative methods in Informatics. The School of Computing and Informatics at Arizona State University wants to provide education in Informatics to the general student population and the community. We have launched the Informatics Certificate, which is a 20+ credit hour program that is designed to marry a student�s domain science (degree program) knowledge with studies in Informatics. Please see the certificate's website for more information. To use methods that store, index, and retrieve information on computers, as well as understand the basic principles behind their operation. To use methods for representing, creating, and running routine activities on computers, as well as understand the basic principles behind their operation. To use methods for modeling, inference, and visualization on computers, as well as understand the basic principles behind their operation. To use methods for decision making and problem solving on computers, as well as understand the basic principles behind their operation. To use methods for communication, networking, and interaction on computers, as well as understand the basic principles behind their operation. Text: None; Readings will be available on the web. In each class period, a guest lecturers will introduce one element from the topics listed in 'Course Objective and Outcomes' above. Each topic will be motivated by a real-world informatics tool, and then this tool will be explored in more detail, in a more general framework. Please see the 'class schedule and announcements' page for a tentative schedule. The schedule will roughly follow the topics as ordered above, and end with areas for integrated applications. have fun learning new things. A few readings will be assigned. These readings will be coupled with the lectures, and we will use the discussion board to reflect and further explore them. "Plus grades" (A+, B+, etc) are earned through above average class participation. Please check the website for ASU's Disability Resource Center for assistance. Students with special needs should contact the center a priori in order to secure assistance. The highest standards of academic integrity are expected of all students. The failure of any student to meet these standards may result in suspension or expulsion from the University or other sanctions as specified in the University Student Academic Integrity Policy. Violations of academic integrity include, but are not limited to, cheating, fabrication, tampering, plagiarism, or facilitating such activities.